The LORD appeared to Abraham. The LORD promised that Sarah would have a son. Sarah laughed in disbelief. Abraham pleaded with the LORD to spare Sodom. To escape the hot afternoon sun, Abraham was sitting in the shade at the entrance to his tent that was pitched near some oaks trees that belonged to an Amorite named Mamre. He saw what appeared to be three men standing nearby. Acknowledging their importance, he hurried to meet them. Abraham then bowed low to the ground as a sign of respect and submission to their superiority. One of those three men was the LORD. We later learn in Genesis chapter 19 that the other two visitors were angels. The word LORD found in the English translations of the Old Testament, when spelled in all capitals, represents the personal name of God. This name is comprised of the four Hebrew consonants – Yod, Hey, Vav, and Hey. These four consonants, as recorded in the oldest hand written scrolls, had no accompanying vowels. Therefore, the exact pronunciation of these four letters is unsure. Yod, Hey, Vav, Hey is known as the “Ineffable” or “Unutterable” Name of the God of Israel. The English name “Jehovah” was constructed by Roman Catholics sometime in the middle ages, based on a misunderstanding of Masoretic Hebrew texts. It is a hybrid word consisting of the Tetragrammaton or 4 letters (“J” used to be pronounced as “Y”) and the vowels for the word “Adonai” which means supreme master or lord. The personal name of God, which is represented in our English Bibles as LORD or Jehovah, is more accurately pronounced as Yahveh or Yahweh. 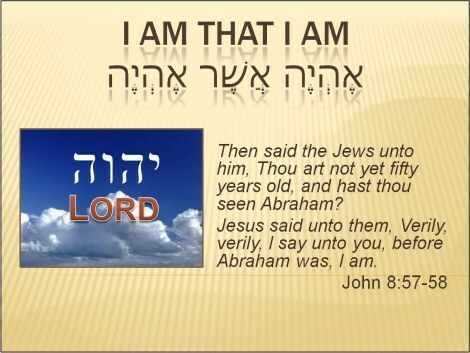 I Am that I Am ('ehyeh ašer 'ehyeh) is a common English translation of the response God used in the Hebrew Bible when Moses asked for his name (Exodus 3:14). Hayah means “existed” or “was” in Hebrew. “Ehyeh” is the first person singular imperfect form of “hayah” and is usually translated as “I will be.” Ehyeh asher ehyeh literally translates as “I Will Be What I Will Be.”However, in most English Bibles, this phrase is rendered as I am that I am. "Your father Abraham rejoiced to see my day: and he saw it, and was glad." Then said the Jews unto him, "Thou art not yet fifty years old, and hast thou seen Abraham?" The crowd he addressed in the temple was going to stone Jesus for what they believed was blasphemy. Not only did Jesus claim to pre-exist the patriarch Abraham, but He identified himself as God using God’s name – I AM. When the LORD appeared to Abraham in the form of a man along with two angels, it was a pre-incarnate appearance of Jesus. In our English translation it reads that Abraham said, “I f I have found favor in your eyes my lord…” In verse 3 of Genesis 18, the letters of the word lord are in a lower case because the Hebrew word being translated is Adonai which is a title of respect. It is not LORD written in capitals which denotes Yahweh – God’s name. In ancient times the foot was protected only by sandals or soles, which fastened round the foot with straps. It was therefore very refreshing in Canaan’s hot climate to get one’s feet washed at the end of a day's journey and rest under a shady tree. Although Abraham had 318 trained men at his command and many servants, he implores his visitors to allow him to personally serve them. Abraham who was very wealthy and influential displays humility and personally cares for his guests making sure that they have their feet washed. This is a foreshadowing of the ministry of the Son of God who would humble himself by being made in human likeness and would take on the very nature of a servant. Washing feet was a chore that was given to the lowliest servant in the home. Although Jesus, the Son of God is the captain of the hosts of heaven, He demonstrated humility and set an example of servanthood for His followers. Abraham the patriarch of the Jews, not only set a select prepared calf before the LORD and His two angels, but gave them curds to eat and milk to drink along with their meat dish. One explanation as to why cooking a goat in its mother’s milk was prohibited is that it may have been one of the ways the Canaanites would offer up sacrifices. After boiling the young goat they would take the milk and sprinkle all the trees, fields, gardens, and orchards around for the purpose of making them more fruitful the following year. Then they would eat the young goat. Another possibility in understanding the intent of this restriction is that it is a prohibition against cruelty. The life of a suckling kid should be sustained by its mother’s milk and not a means of its death. Sarah was situated behind the LORD as she listened at the entrance to the tent. God is omniscient and not only knew what was going on behind Him, but what was in Sarah’s heart. Sarah laughed to herself in disbelief. In her fear and shame, she lied and said that she did not laugh. The fact that Abraham also sought a blessing for Ishmael attests to the fact that Abraham believed that he and his wife Sarah would be blessed with a son in spite of their advanced ages. Therefore, Abraham’s laughter was a reaction of his delight because he believed God’s promise, while Sarah laughed because of her doubt. The LORD asked a rhetorical question, “Shall I hide from Abraham what I am about to do?” Then He makes it clear to the angels with Him as to why He will share his plans with Abraham. Abraham would become the patriarch of Israel and in the line of the Messiah. Abraham was chosen because the LORD foreknew that Abraham would be faithful, not only to direct his children to be devout worshippers and keep the way of the LORD, but his servants as well. Parents have the primary responsibility to instruct their own children in the ways of the Lord. Sunday school teachers and pastors should serve in a supportive role, but are not in the position to raise other people’s children. According to 2 Peter 2:7, Lot was a righteous man who was distressed by the filthy lives of the lawless men who dwelled in Sodom. Most probably the outcry against these wicked cities was from Lot because only he, his wife and his two daughters were initially spared from God’s judgment upon these cities and their inhabitants. God, who is omniscient, already knew that the outcry against Sodom and Gomorrah was an accurate assessment of their wicked deeds. But the purpose of His manifest presence and personal investigation of the matter along with two angels was for the benefit of Abraham and a foreshadowing of the requirements of Torah. The investigation by the LORD and His two angels was to establish the validity of the accusations against the inhabitants of Sodom and Gomorrah by the testimony of two or three witnesses. The two angels went towards Sodom but the LORD remained with Abraham. Abraham knew that the LORD would judge righteously. Since the angels were heading for Sodom, Abraham probably had Lot in mind when he asked the LORD, “Will you sweep away the righteous with the wicked?” This is the first record of intercessory prayer in the Bible. Abraham comes before the LORD his Creator in humility stating that he was created from the dust and would return to the dust. Note that the LORD did not rebuke Abraham either for pleading for the city to be spared or for negotiating down the number of righteous people necessary to spare the city. For the sake of ten righteous people, the LORD would spare Sodom and not destroy the city. Noah and his wife and his three sons and their wives were the only people on the entire earth who were saved from the outpouring of God’s judgment. In the days of Noah, the number of righteous only totaled eight people falling short of ten, and therefore the earth was not spared but destroyed by the flood. The first synagogues probably originated during the Babylonian captivity of 606-536 B.C. Enslaved Jewish exiles who had been carried far from their homeland obviously could not travel to the temple to worship, and so they began to gather together in communities (“assemblies,” or “synagogues”) dedicated to preserving the word of God and their devotion to the Torah. Although the Jews were permitted to return home in 536 B.C. (Ezra 2), millions never returned to Israel, but instead continued to live dispersed through various parts of the world. In Jesus’ day, there were 4.5 million Jews scattered throughout the Roman Empire, a most of whom belonged to a local synagogue in the community where they lived. Thus, there were faithful “pockets” of Judaism scattered throughout the civilized world because of the existence of synagogues. By the first century A.D., the synagogue had become a center of Jewish religious and social life in most communities. To establish a synagogue, a community first needed to have ten adult Jewish males called a minyan. An adult Jew is any Jewish male who has passed his thirteenth birthday. The most common activities requiring a minyan is public prayer and public reading of the Torah. Although some people believe that concept of ten men to form a minyan was based upon ten righteous to spare Sodom, the Biblical source for the requirement of ten men to complete a "minyan" (literally – count or number) is from Numbers 14:27. Moses sent spies to scout the land of Canaan. Ten of them returned and issued a report concluding that it was not a conquerable land. God was angered their lack of faith. He turns to Moses and Aaron telling them: “How long will this evil ‘assembly’ provoke [the Jewish nation] to complain against Me?" From here it is deduced that an ‘assembly' is comprised of ten men. It was easy to find an assembly of ten wicked men among the Israelites in the wilderness, but ten righteous men could not be found in Sodom. Because of the graciousness and mercy of the LORD, had ten righteous men resided in the City of Sodom it would have been spared in spite of the extreme wickedness of its people. Genesis Chapter 19 - Sodom and Gomorrah Destroyed by Angels!